The story of the American bison (the “buffalo” as it is called in the USA) has been rehearsed many times, how the settlers shot them for their hides, or sometimes for their tongues. They shot them just for fun from the platforms of trains, and killed them for malice to starve the Native Americans. It gets worse. The last man to seal the bison’s coffin was a researcher from the Smithsonian Institute in Washington DC. There were once 30 million bison in North America, in two great “herds”, a northern one ranging into Canada and a southern one that wintered in Texas. They ranged from Utah to Pennsylvania. By 1886 bison had almost disappeared, so the Smithsonian Institution sent William Temple Hornaday out west to investigate. The resourceful Hornaday gathered a team of hunters and guides, provisioned himself with wagons of food and ammunition and set off for the wilds of Montana, where a remnant herd of about 35 bison still ran wild. Hornaday already knew that there were only about 400 bison left alive, 200 in the newly created Yellowstone National Park, and 200 scattered around on private ranches. Bison had once been naïve and easy to shoot. Sometimes the beasts simply stood still while the hunters shot them down. At other times when the bullets started to fly, the terrified animals bolted off in a wild dash into the wind (where they could smell their way). In his book, The Extermination of the American Bison, Hornaday describes in loving detail how this last wild herd in Montana was now more cautious of people. Hornaday simply assumed that nothing could be done for the bison, that they were doomed to extinction. He (and his backers) imagined that when all the bison were gone, it would be nice to have a few stuffed bison in naturalistic poses, inside a glass case for the museum-going public to see. By 1886, the remaining, wiser bison had finally learned to run in different directions at the first shot, and to hide in the ravines. And bison run pretty darned fast. Even so, Hornaby and his crew managed to kill 20 of the creatures, and crate their hides and bones back to Washington, where the remarkable Hornaday, who was an expert taxidermist, preserved six dead bison, from calves to old cows and bulls, for a diorama of the Great Plains. Wildlife conservation has come a long way since then. As a species though, the bison got lucky. As an afterthought, Hornaday brought back two calves. It was the least he could do, since he had killed their mothers and they had wandered into his camp and taken to following the men around. These calves became the nucleus of the bison herd in the National Zoo, in Washington. S.L. Bedson, of Stony Mountain, Manitoba and C.J. Jones of Garden City, Kansas and other ranchers managed to buy up scattered bison from other cowmen who had only one or two animals, until they gathered small, reproducing herds. In 1986 the management of Yellowstone National Park passed from the Interior Department to the U.S. Army. Hunters slipped into the park to slaughter the last remaining wild bison (to sell their hides). The poachers were heavily armed and light on scruples, but Captain Moses Harris and his men chased them out of the park.. 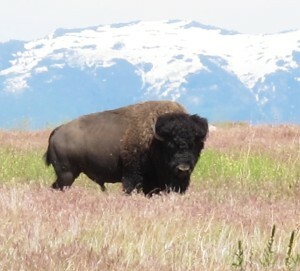 Thanks to the efforts of a few ranchers and soldiers the bison survivedin parks, ranches and zoos. Yet their ecosystem is gone: the wild grasslands have been plowed up, and replaced with maize, soybeans, and pick-up trucks. The bison or buffalo no longer thunder their way north and south in great, reddish brown rivers in search of fresh pasture. Some people are even raising bison commercially, and its lean, tasty meat is back on the menu. In Washington DC, you can have a bison burger at the restaurant in the Museum of the American Indian, which is part of the Smithsonian Institution, the same outfit which once backed Hornaday’s taxidermy expedition. Hornaday might be pleasantly surprised to see that the bison was not exterminated after all. Hornaday, William Temple 2002 (1889) The Extermination of the American Bison. Washington: Smithsonian Institution Press.